I hope it’s nice and warm where you are. We got a ton of snow yesterday and even more is on the way. I shoveled snow three times in the past day and you can barely even tell! But we got a nice snow pile out of it that my kids are using to sled down, and we even built a snowman! That’s the first one I’ve made in at least 20 years, and it was so much fun. Winter is definitely here. Inside, we’ve been trying to keep nice and warm as well! I’ve had soup simmering on the stove and it’s been amazing to be so snug and warm under the blankets while looking out the window at the fat snowflakes falling down so thick that just across the yard looks like it’s in a fog. It’s so incredibly beautiful, like a winter wonderland to just be surrounded by white falling snow. Even though I’m not a fan of the cold, and I really don’t like driving in it, when I’m safe and warm at home, winter has its moments of being magical. And there sure is a lot of it! And now we’re in February already. I had all these goals of everything I wanted to accomplish in January, and so little was accomplished. We instead passed around the flu and slept and drank lots of water and tea, and when I had the choice of whether to sleep or to crochet, I slept and slept. Maybe I even hibernated, because it doesn’t seem like it should be February already, does it? It seems like around this time every year, when I’m home bound and sitting among my yarn that I get inspired to join a crochet swap. I joined one last spring with the Pink Lemonade swap, and then the year before with the Carrots swap. The problem is that the swaps usually end in May, when no one is still sitting at home looking at the snow anymore. May is one of the busiest months around here, with quite a few birthdays, the obligatory graduation parties, taking finals, planting the garden and finally getting some warm enough days that finally ease our cabin fever. By the end of the swaps, I’m no longer inside crocheting, and usually stress myself out trying to catch up. This year, I’m trying to be a little bit more proactive and starting early when I actually am at home. The theme for this swap is “sprouting hues” and the colors are what lured me in. I’ve always loved earthy colors, and dreaming of my garden is only adding to that. I even started a separate blanket (the Big Colorful Throw) in these colors as a complement. So in the past week or two I’ve made up a couple of squares for the swap. Wouldn’t you know, they were not easy squares for me! The patterns were written well enough but for some reason I had a lot of difficulties. The rounds rippled on one, which I pulled out and re-did three times; on another, it was just me not paying close enough attention to the pattern and not realizing it until several rounds later when I didn’t want to rip them out. But overall, I think they turned out nicely. The first one I made was this Picture Frame square. I first saw it on Pinterest, and saw that it was an Interweave download. I went ahead and followed the link and purchased the digital magazine, only to realize that it had linked to the current edition instead of the Fall 2010 issue where it was featured. Oops. So then I bought the correct digital issue, which made this pattern a very expensive one for me! The link to the actual issue is here if you’re interested in buying one. In order to cut my losses, I tried another one in that issue. 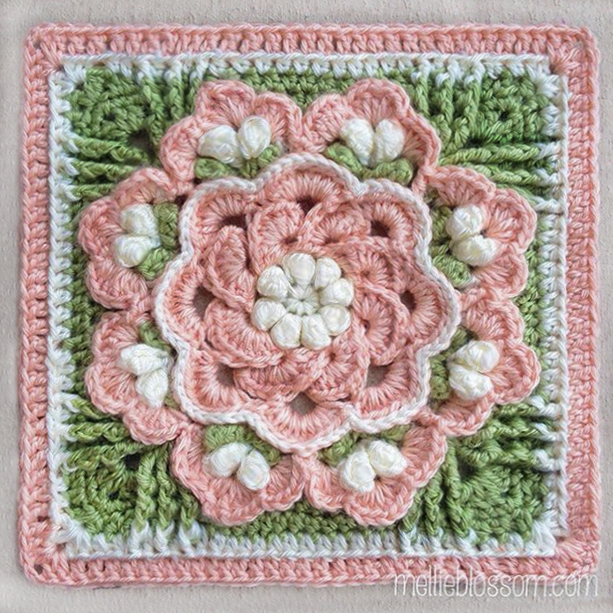 This one is called Lotus Blossom, and wouldn’t you know that this afterthought square turned out to be one of the most beautiful of them all! I had such a good time making this, and the pattern went to easily. Finally, I found this third pattern that I just fell in love with… and also messed the pattern up. No worries, I’ll be making this one again soon. I love the effect of the different colors throughout the square. Even though my version isn’t perfect, it still turned out nicely and definitely acceptable for the swap. 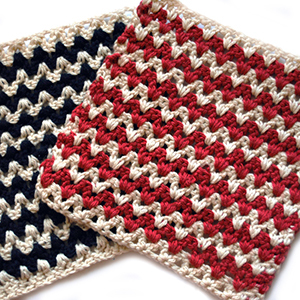 This square is called Twist and Shake and you can find it here for free. I have a little under 2 dozen left to do, so I’ll be posting some more soon! I’m keeping my eye open for lovely granny squares to crochet, so let me know if you see any that catches your eye!